One was seen at Herringfleet Marshes on January 4th, at Blundeston Marshes on the January 8th and at Herringfleet Hills on September 2nd. One adult was with Barncle Geese at Lound Waterworks on August 14th. Two adults were with Barnacle Geese at Lound Waterworks on the September 11th. One was with c.250 Barnacle Geese at Benacre Broad on October 26th. One female was on Gunton Hall lake on January 9th. View from the car park at the adjacent Tesco superstore. Two were feeding by the roadside at Ashby on April 2nd and 3rd. A peacock was wandering down Corton Street on the 6th. One was on Burgh Castle Marshes on September 26th. One was seen in flight over Gunton Warren on April 24th. Corton - October 9th, one flew north over Corton Woods and was also seen continuing to head north at Stirrups Lane shortly afterwards. Corton - September 3rd (south along cliffs then north). Lowestoft North Denes (campsite) - September 6th (N). A male of this sub-Saharan weaver finch relative was present on the North Denes along Gunton Cliif on August 9th. 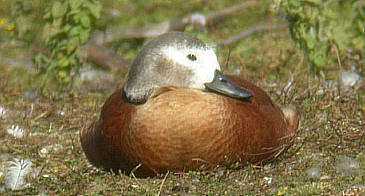 One adult was feeding in a stubble field with a flock of Canada Geese along Jay Lane, Lound on November 20th and 21st. It had also been seen leaving roost at Berney Marshes RSPB reserve at dawn on the 20th. Two were on the Kessingland Levels on May 1st. Three adults and a juvenile were with the Barnacle Goose flock at Lound Waterworks on August 29th. One adult was with a flock of Barnacle Geese that flew south past Kessingland on the 30th. Leathes Ham - January 10th, February 8th, July 11th. Oulton Broad - January 18th, 24th, February 1st. Lound Waterworks - August 7th. Burgh Castle - October 31st. A probable LANNER Falco biarmicus was feeding on a kill in fields along Jay Lane, Lound at dusk on January 2nd. One was seen in a garden in Sharon Drive, Lowestoft on March 26th. One was flying around Station Square, Lowestoft, spooking the local Feral Pigeons, on April 29th. Another was flying north eastwards above Breydon Water at Burgh Castle on July 4th. 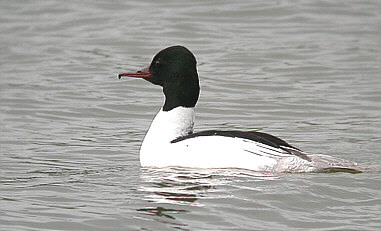 One was seen at Kessingland sewage works on March 27th. One blue and white individual was with Linnets and a Greenfinch on the North Denes on April 7th. A green individual was seen at Lowestoft Railway Station on October 28th. A pair flew over Bond's Meadow, Oulton Broad on December 6th. 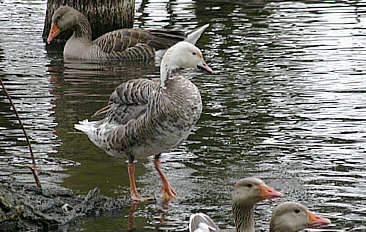 A 1st-year bird was present with large numbers of geese at Lound Waterworks on September 17th and 20th. 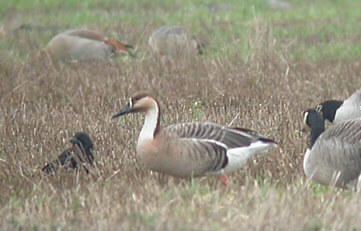 The total number of geese present was in excess of 1000 constituting one of the largest gatherings recorded at the site. This bird was fully winged but with Fritton Lake wildfowl collection is unlikely to be a wild bird. This fabulous species has to be one of the most attractive geese in the world (certainly more so than the gormless Bean Goose pictured above!!!). This male Bar-headed was associating with a flock of 350+ Barnacle Geese at Lound Waterworks on September 17th and 20th. Whilst wild birds do occur (proven by the presence of ringed individuals many feral birds breed in wildfowl collections at Fritton Lake and Kessingland Wildlife Park. No doubt the fencing at both sites keeps ground predation to a minimum and food handouts are a bonus as well. At Kessingland Wildlife Park 40 were accompanied by a small Canada Goose on March 8th. March 2nd (55), early July (4), September (350+), 17th (360+), 20th (363). An adult seen in flight with Barnacle Geese over Fritton Lake on March 6th was presumably from the wildfowl collection there rather than a wild bird. A quite distinctive Emperor Goose X Greylag Goose hybrid was noted with a flock of 90 Greylags at Lound Waterworks on January 25th. It acts as a particularly good marker for local goose movements as it has been seen subsequently at Herringfleet, Oulton Broad, Lound water works and Leathes Ham. On June 28th it was photographed at Leathes Ham. 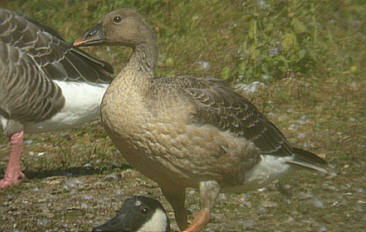 It is paired up with a Greylag Goose but does not appear to have bred this year. 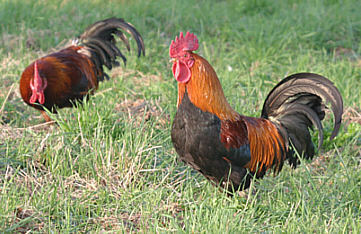 It may of course, like many hybrids, be infertile. The most recent sightings were at Lound water works on September 17th and 20th and October 10th; then again at Leathes Ham on December 15th. This wonderful bird was an addition to the Lounge Lizard list and the third species of Shelduck recorded in the area this year!!! It was present at Lound waterworks on September 17th. 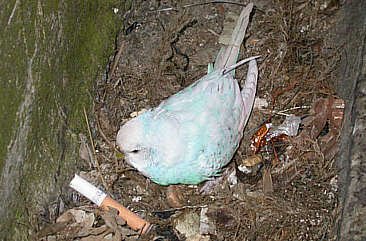 The extensive grey markings on the head would indicate its a female. 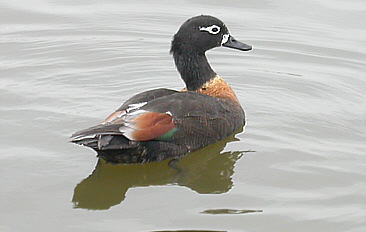 A female was present on Oulton Broad from at least the June 14th to the 22nd. Unlike the Goosander it is fully winged!!! Two have been seen on Oulton Broad in early June. There used to be a population of over 100 in the area, but they mysteriously vanished. Two were still present at Oulton Broad on December 24th. Always a delight to see. A stunning male was on Leathes Ham April 5th and 6th. When news broke of an unseasonal drake Goosander on Oulton Broad on May 17th we finally thought we had something good to take pictures of. Initial views that evening didn't give rise to any suspicions as the bird did not seem that tame, and indeed made a fast get away (running across the water not flying) preventing any good photos being obtained. Crippling views were afforded the next day as it was feeding with the local Mute Swans on bread thrown by tourists from their boats at The Boulevard!!! A teeny bit suspicious for a species that normally eats fish. Then it flapped its wings, or should that be wing? Being pinioned it had had no choice but to run away across the water the evening before. It was last reported on Oulton Broad on June 9th. Then it mid-June it was sighted at our northern boundary on Breydon Water. We wonder how long it took to swim there? 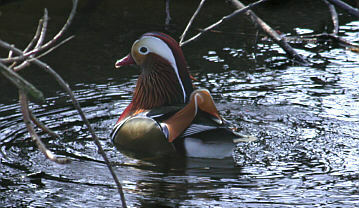 A male had been seen a little out of our area along the River Waveney at Bungay on April 26th. Although a little bit later than most of the winter records in this area it did not cause too much excitement. It seems highly likely that the same bird was involved. One was seen in Poplar trees at Pakefield on October 10th. It was being mobbed by Crows. At 14:10 on the 8th a probable Lanner was attacking Common Terns about 200 metres from the beach at Kessingland before climbing high and flying off to the west. One was later seen further south at Benacre Broad the same day. On April 17th one blue and white bird flew in from the north and landed at the end of the South Pier and began foraging for food in the guttering. It doesn't look like it has been taking any notice of Government health warnings regarding cigarettes!!! A list of escaped species recorded in our area is featured on our Checklist Page.